This Horse Bit can be used as a horse training aid. It will provide an Extraordinary and durable quality, yet are easy to work with and provide maximum comfort for your horse. 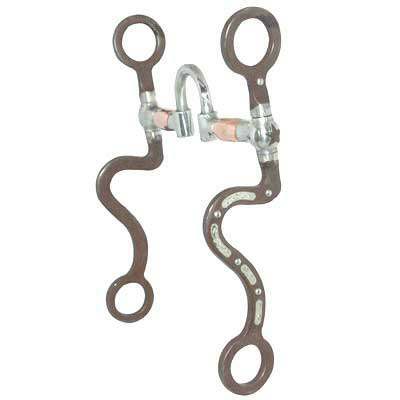 As shown in the picture above, These Robart Medium Port Bits are high-quality horse tack items. This particular bit features medium port with copper roller accenting the spring system, as well as calvary shanks. Helps elevate shoulders and creates give at poll, which is all offset by an engraved silver bit. Comes with copper barrels, which increase salivation and reduce aggrevation in the mouth as the bridle slips over the sensitive parts of the mouth. This Premium Horse Bit is made to last for many years to come and rest assured you are buying superior quality bits here at Horse Tack Now.